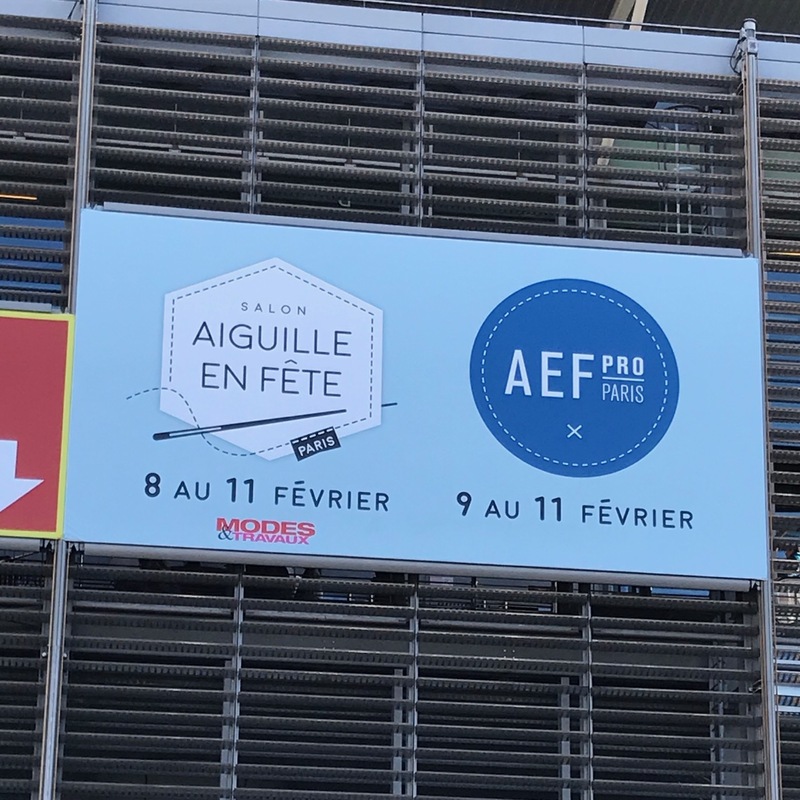 Aiguille en Fête is Paris’ main needlecraft show. For the past few years, I have seen pictures of this show on my social media timeline and it looked like a really nice show so I thought it would be great to attend. An even better idea was to combine it with a visit to the Au ver à Soie premisses during the Nuit de la Broderie (transl: Night of Embroidery) which they hold twice a year and which besides the monthly Lundi Soie (transl: Silk Monday) is the only opportunity to visit Au ver à Soie as it is not normally open to the public. 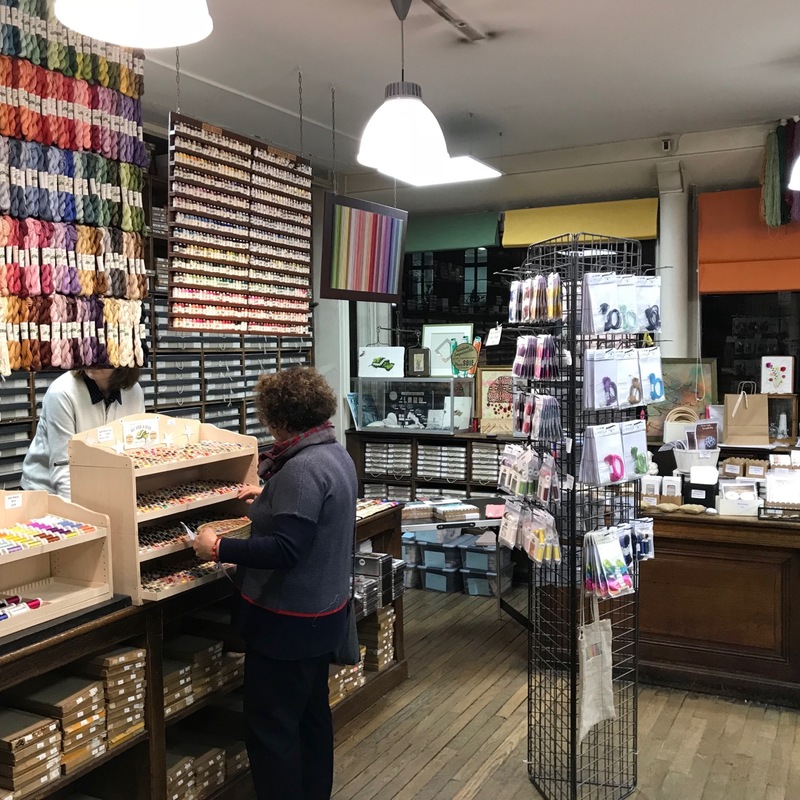 When I mentioned my plans to Catherine of Hillview embroidery she said she had always fancied visiting the show as well and the idea was born to take an embroidery trip to Paris together. 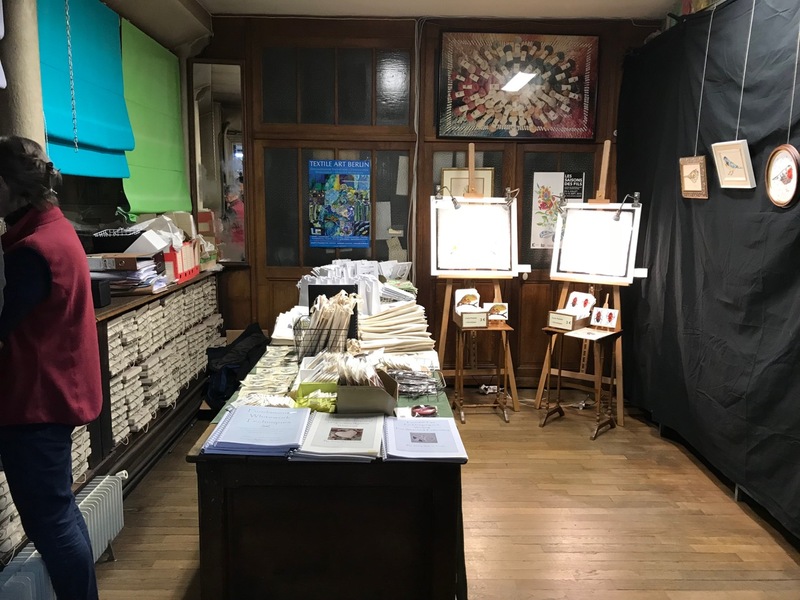 We soon found out that besides the Nuit de la Broderie Au ver à Soie was also hosting several workshops with Nicola Jarvis and Jenny Adin-Christie on the days of the show. Catherine and I signed up for a goldwork brooch workshop with Jenny on Friday afternoon. 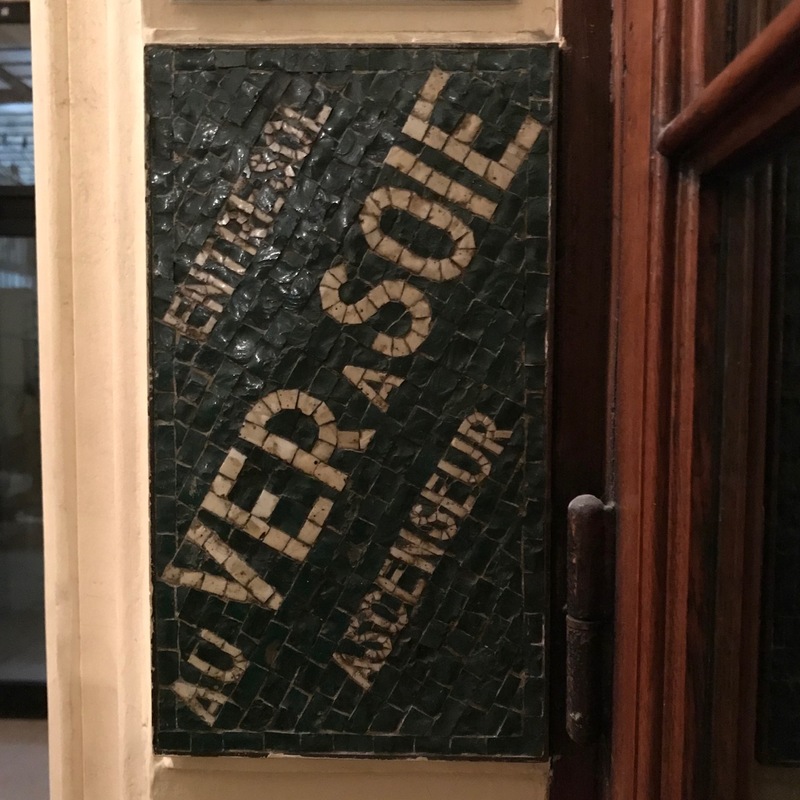 Because of the snow in Paris, a slightly delayed train and an unavailability of taxis we had quite a challenge to get to the Au ver à Soie premisses on time after arriving in Paris by Eurostar that morning but we arrived exactly on time at 13u30, which amazed us both. There were 6 people in the workshop and since the majority of people (including Jenny) spoke better English than French the workshop was conducted in English with the occasional translation being provided by Jenny or one of the students, which expanded my knowledge of embroidery French at the same time! After a brief introduction, Jenny started us off with the padding of the brooch and couching passing threads around the outside. She then showed us how to create a rose and leaves with purl. 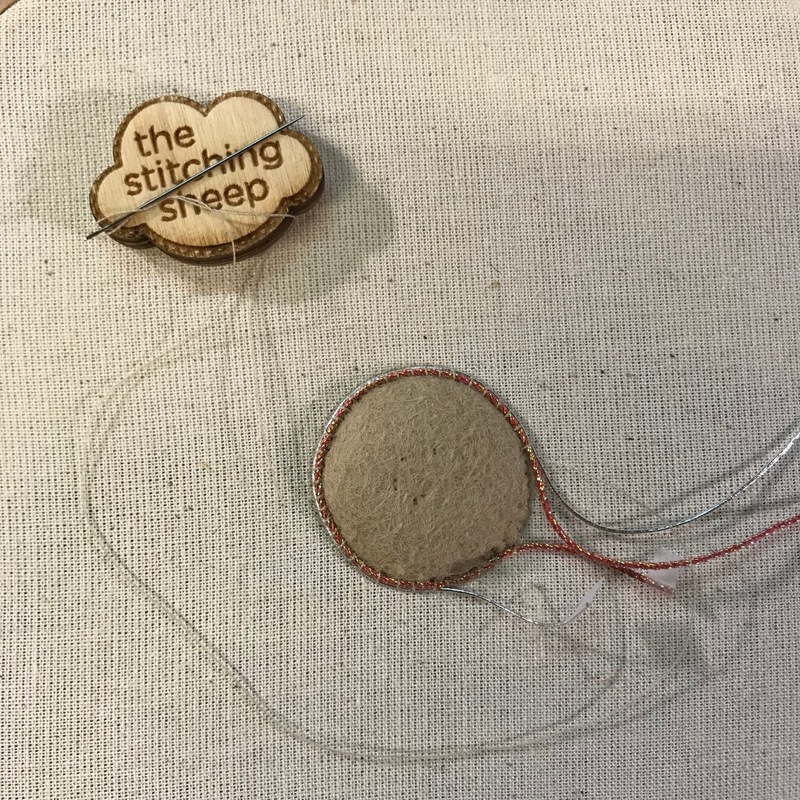 Jenny constantly provided great tips on how to get the purl to curl the right way by angling your needle, and on how to remove damaged purl without unstitching your entire design. 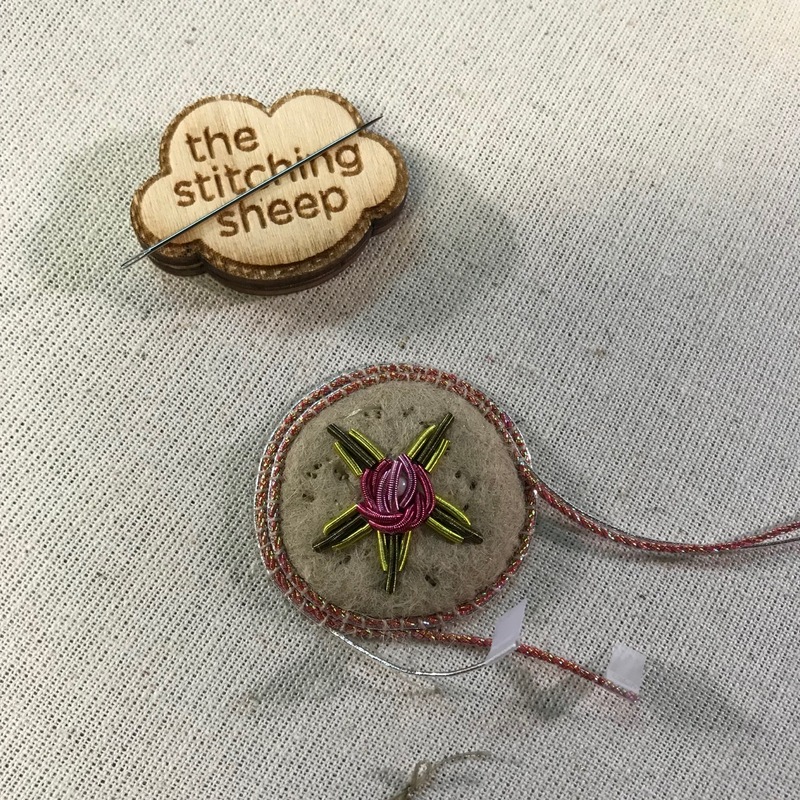 At the end of the workshop, Jenny quickly explained how to finished your brooch at home. I learned a lot during this short (3 hrs) workshop and Jenny is a really lovely and encouraging teacher. I will definitely do another workshop with her. 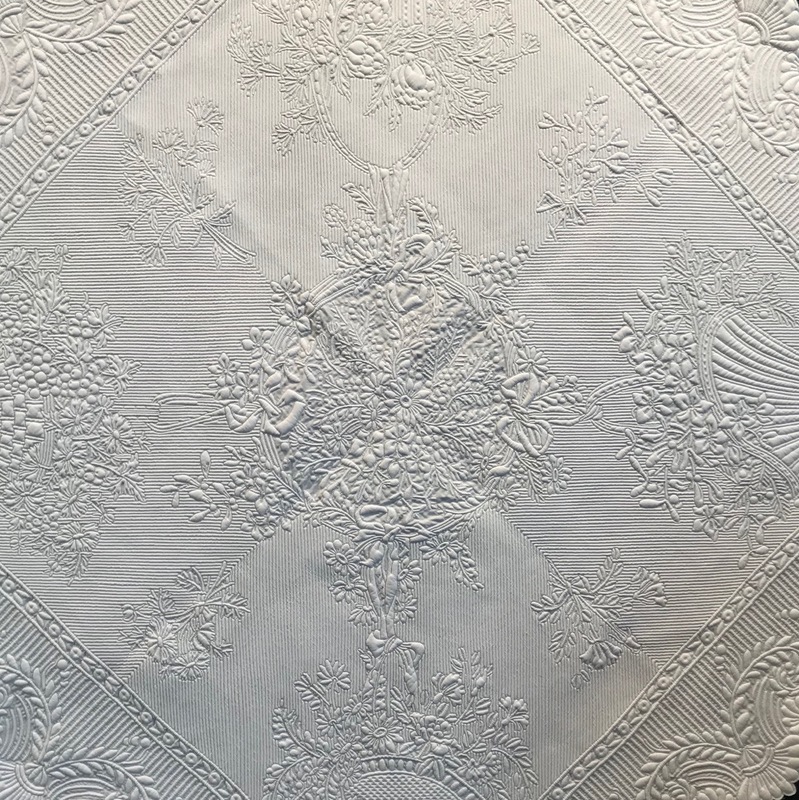 At the end of the class, I showed her pictures of my finished pheasant and whitework thistle which are both designs by her for Inspirations magazine. She really liked my pheasant and gave me tips on how to improve my satin stitch for whitework. 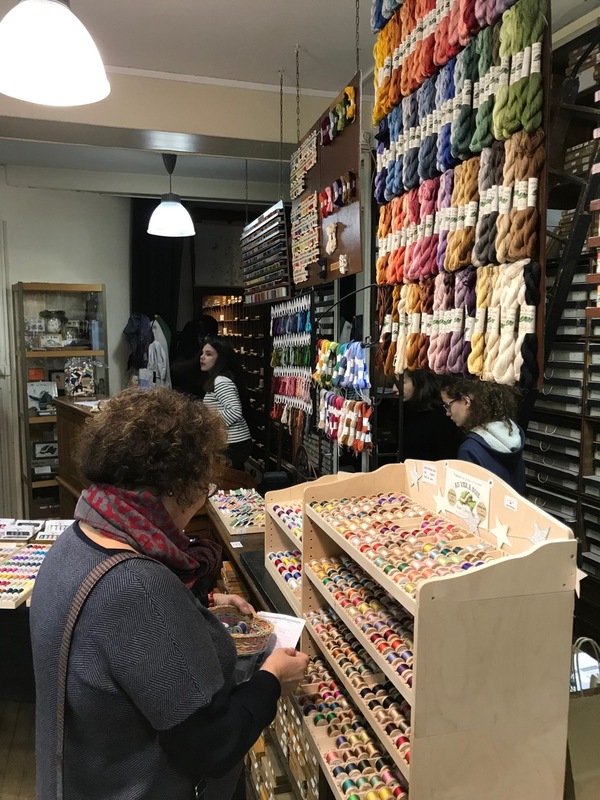 After some dinner, and a visit to the wonderful Sajou shop just around the corner from Au ver à Soie, Catherine and I returned to Au ver à Soie for the Nuit de la broderie. On arrival were given a shopping list on which the assistants would mark the items you had chosen so you only need to pay for and collect your items at the end of your visit. As I have picked my design for my RSN certificate Canvaswork project I wanted to get some Soie d’Alger for the sky. I bought lots of blues, pinks and greys to try and recreate the dark clouds and the bright sun. 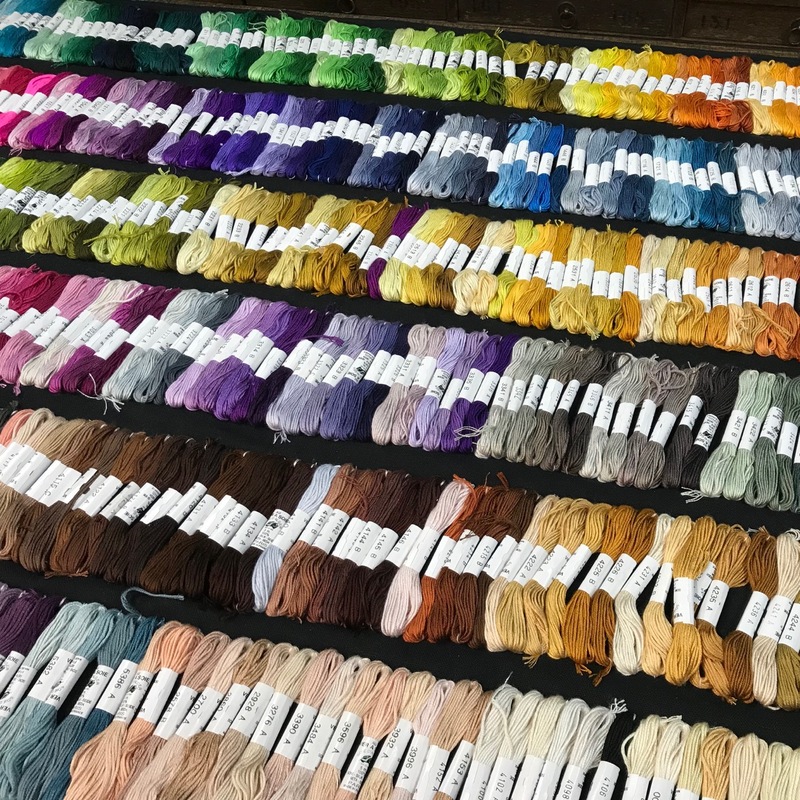 Between now and July (when my course is) I will have plenty of time to practise and get the right colour combinations. I also bought some taster packs of Soie Perléé. When we left we were allowed a lucky dip of an Au ver à Soie metallics (I got pink). 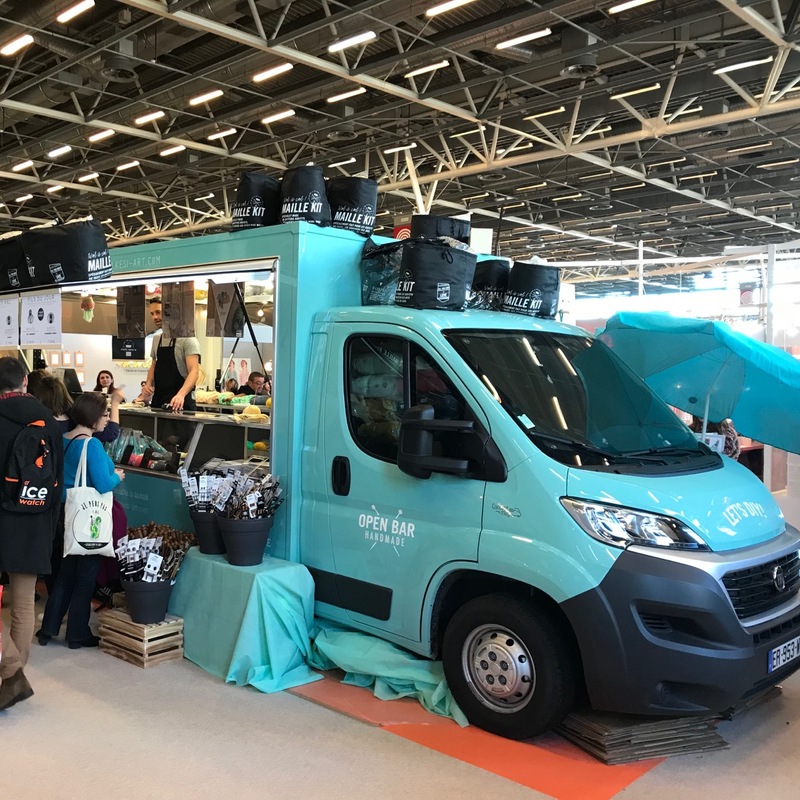 On Saturday morning we left quite early for the Aiguille en Fête show at the Porte de Versailles exhibition centre as we anticipated that the Saturday would be very busy. On arrival, we commented on how light and well set out the show looked. Nearly all the stands were very tastefully decorated and there were lots of pretty things and good quality items on sale. There were hardly any stands selling cheap or poor quality items which makes a very welcome change from other shows that we had visited. 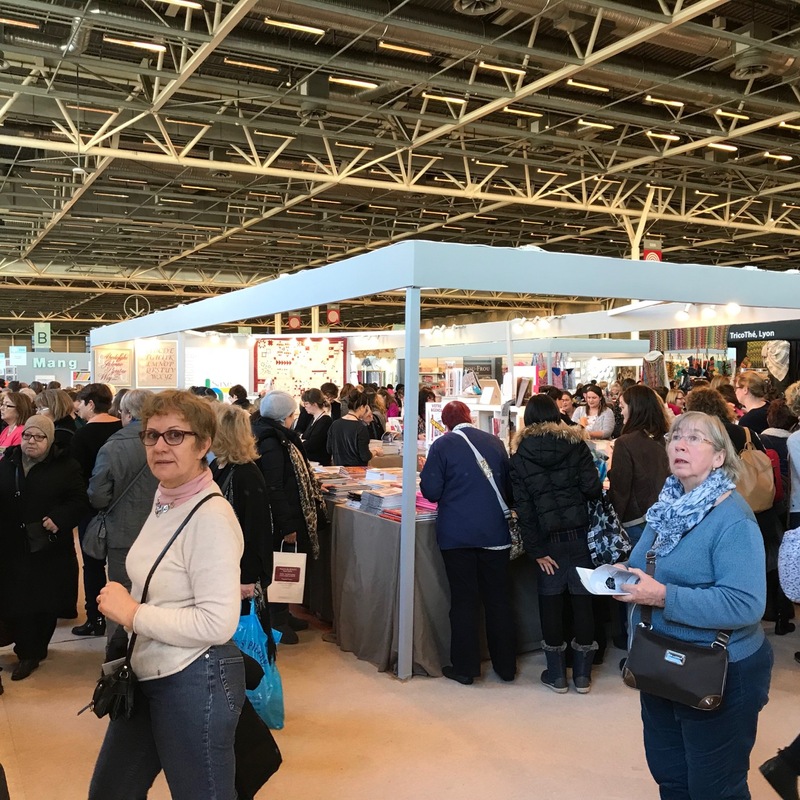 There was quite a number of stands selling embroidery/cross stitch designs but fabric-craft was of all the needlecrafts the most wel represented. 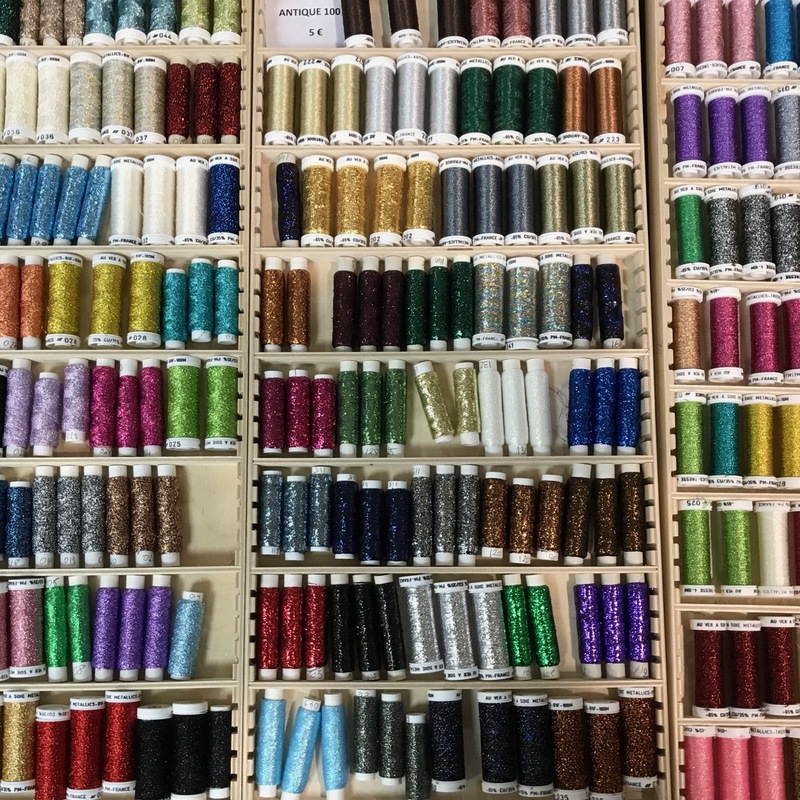 Besides kits, various stands had threads and embroidery fabric on sale to stitch your own design. Catherine and I explored the entire show briefly interrupted by a coffee and tea in the big food court that was part of the show. However, we decided to have lunch just outside the exhibition hall as by lunch time the show had gotten really busy. It gave us an opportunity escape the hustle and bustle of the show and to talk about the stands and items we had seen and which stands we would visit again that afternoon to make a purchase. 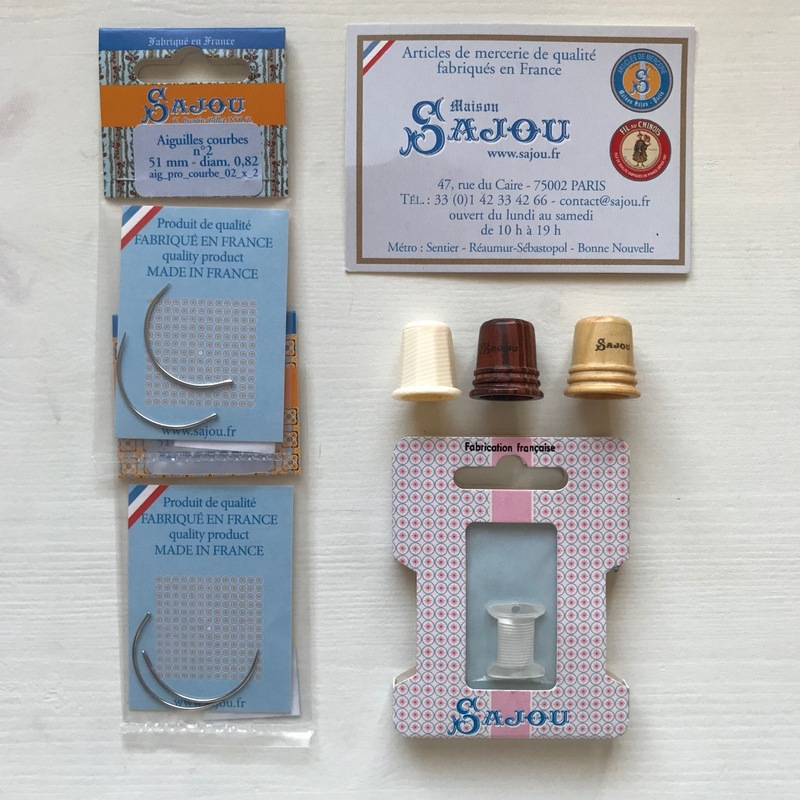 I bought a Sahiko pattern, sahiko threads and needles from Sahiko-Ya. I really liked that they sold a few patterns in other colours besides the traditional blue, as I am not very keen on that colour but I really wanted to try my hand at Sashiko. I chose a dusty pink Hana-Fukin Sashiko sampler and cream and green threads. 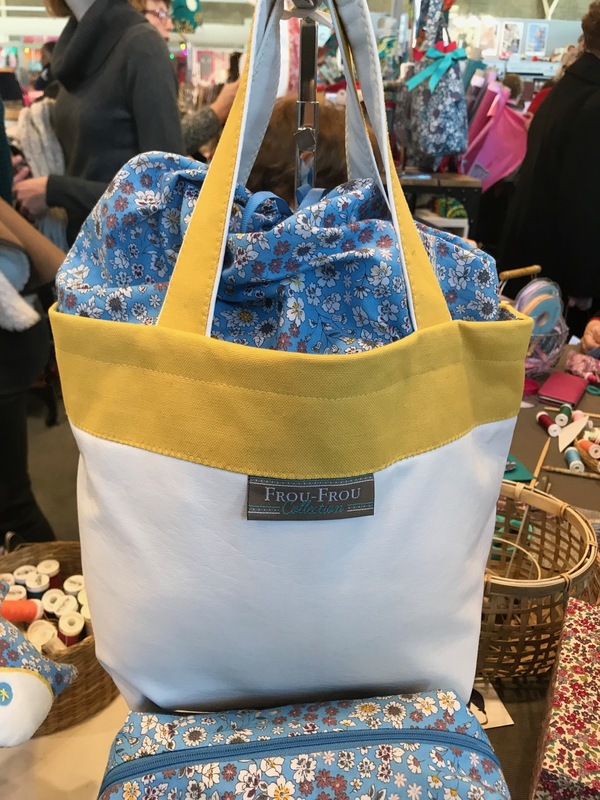 At the FrouFrou stand, I spotted a really lovely bag. I ended up buying some cream and light blue fabric to create the bag and got the pattern for free. At L’île à Mousse stand they sold kits to make really cute bears and mousses which closely remember old-fashioned teddy-bears with limbs that you can actually move. I bought a kit to make Miette the Mouse. The kits contain everything you need to make the mouse apart from the stuffing. I can’t wait to start stitching. 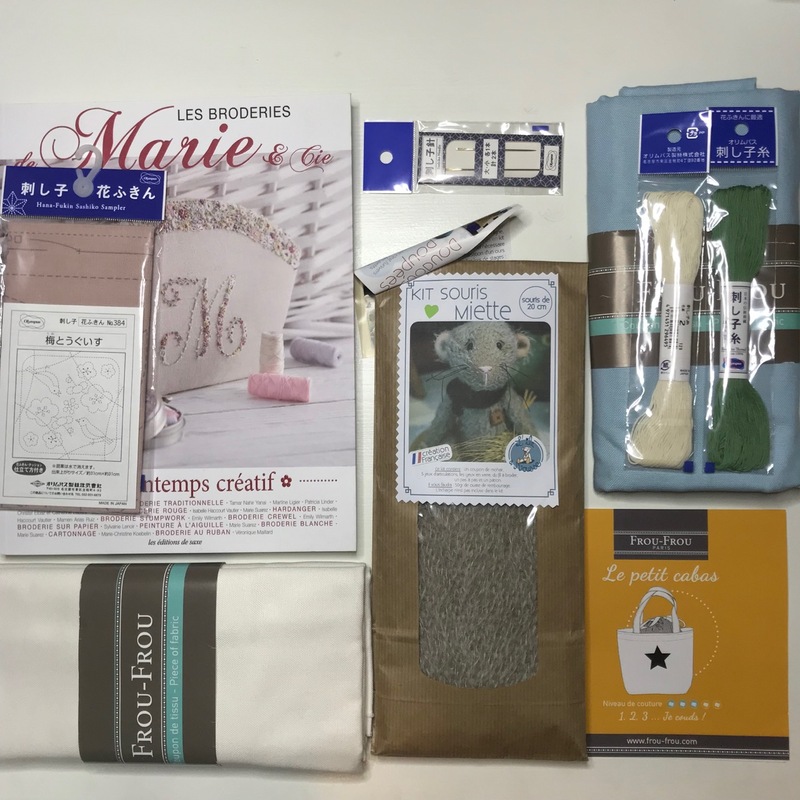 I also picked up one of the earlier Les Broderies Marie & Cie bookazines which had been released before I started my subscription. The books and bookazines Les Editions de Saxe had on display where all really lovely publications. I would definitely had bought more if I hadn’t been worried about the weight of my suitcase for travelling back home. 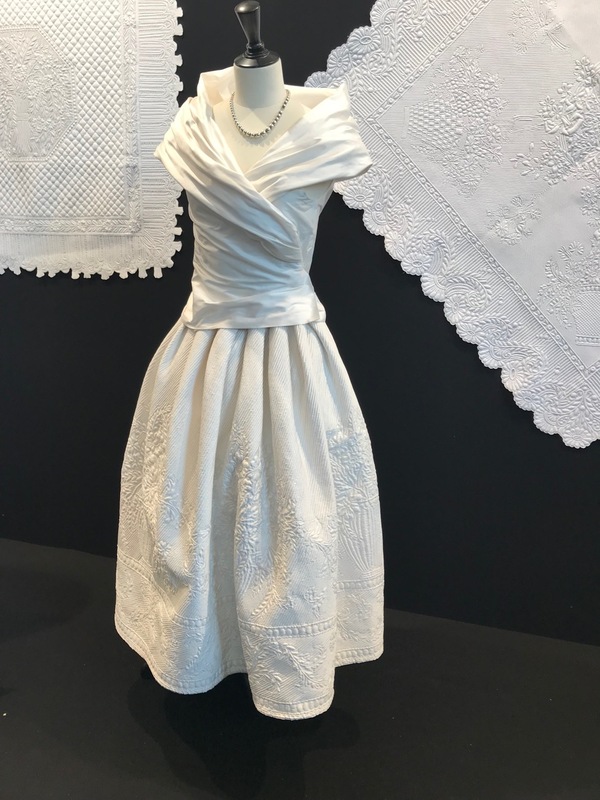 Just before we left we visited the exhibition part of the show, which all fitted in with the theme ‘blanc. We watched a Boutis demonstration by Kumiko Nakayama Geraerts. The designs look really amazing and I would love to give this technique a try. At about half past two we had made all of our purchases and went back to the hotel after a very tirying but inspirational day. I would really like to visit the show again but would definitely try the Thursday or Friday next time as Saturday was really really busy. Both Catherine and I really enjoyed the show. 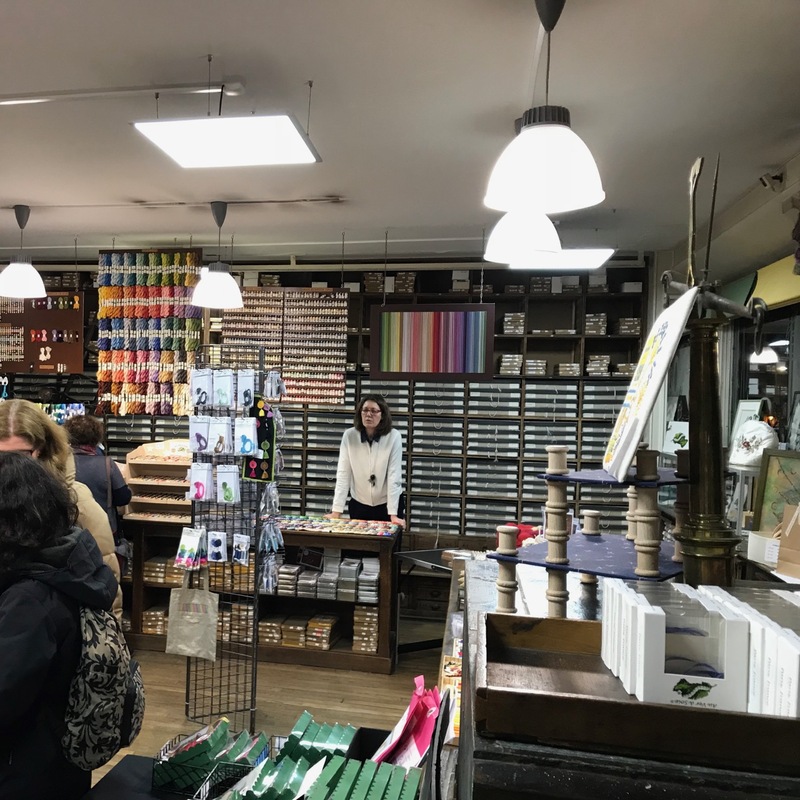 It was a real joy to see so many lovely stands with products, kits and designs that we had never come across before. We also really enjoyed sharing the show with someone who has the same interests as it is really nice being able to bounce ideas off each other and enjoy the same type of stands. Wow! I am unbelievably jealous! It sounds like an amazing trip. I’m heading to the website now to start thinking about visiting the next one! Do! It is a really nice show. I think next year’s one is in March so that should be better weather wise too! Sounds like a marvelous adventure! This show is on my to visit one day but it will have to be very carefully planned since I’ll be coming from so far. Thank you for sharing about your experience. I’m looking forward to seeing what you make. It was, we had a great time! I know even coming from the Netherlands requires a lot of planning let alone from Canada. It was really difficult to decide what to start first as I want to make them all at the same time, but I have started to sashiko sampler last night. I thought it would be very relaxed stitching but it is surprisingly difficult to keep the running stitches neat and even! It is hard but once you get into a rhythm you fall into a relaxing “zone”. Are you stitching in hand or in a hoop? I really like the idea of mindful stitching, but I will need to get used to it a bit more I think before I can get into a “zone”. 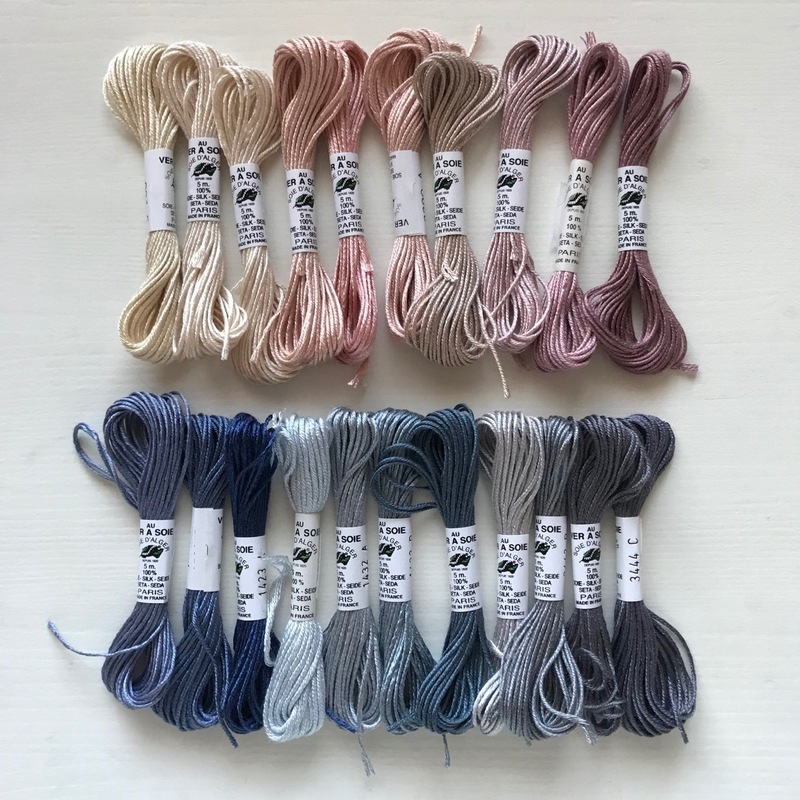 I am going for in hand as apparently that is the way to do it properly and it does enable me to make sure the thread is relaxed and doesn’t pull the fabric. The whole design would be to big for a hoop. Your’s is about the same size as the one I did. You’ve reminded me, I really should finish stitching it. Did you get any ideas on what you will finish it into? I think I might make it into a pillow for my yoga, even though it is a slightly different pink than my other yoga items. I am stitching both squares together as advised to create a strong fabric, which also stops the threads at the back showing through. Not sure whether I will do all of the stitching in white or whether I will introduce some green in there too. It might provide some extra interest as the white on the pink is not very striking on its own. Which design are you stitching? I don’t remember what my panel is called but it has cherry blossoms on it http://d1-d2.blogspot.ca/2017/10/back-to-regular-my-schedule.html I also stitched the two fabrics together. I opted for navy thread because I liked how it looked against the pink. I never thought of blue, but that looks very nice indeed! It is my first go so probably pick up lots of tricks when working on it for my next Sashiko! Dima, do you know whether I should do the dots on my Sashiko-design as French knots? I think you should be ok with using a french knot. I did a quick search and couldn’t find anything about a special knot for sashiko. Thank you Dima! I looked online too but I couldn’t find anything on any knots for Sasiko, so I hoped you would know! I must see if I can get to L’Aiguille en Fete next year. 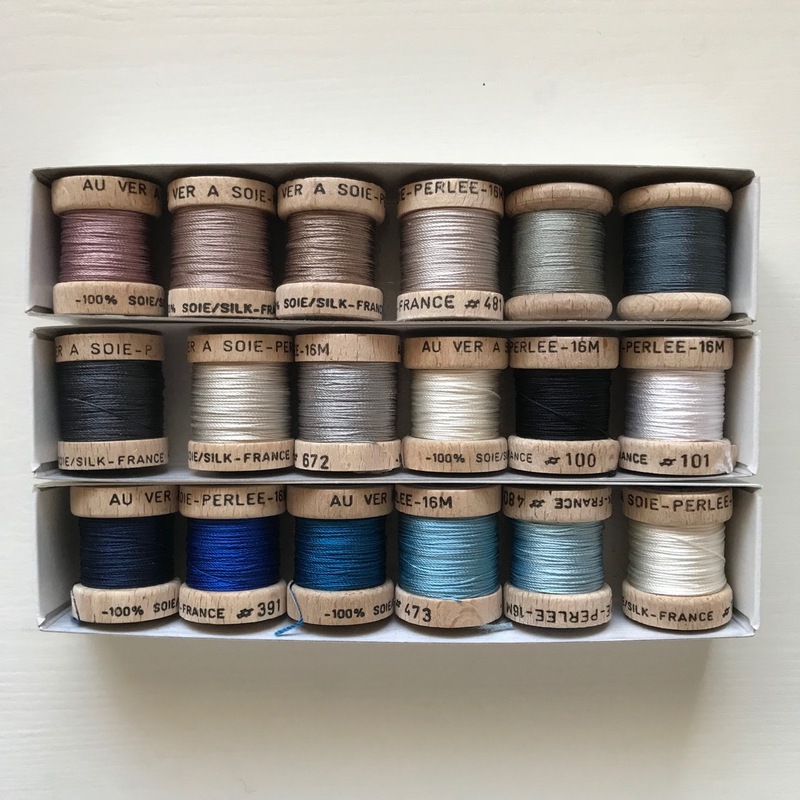 I love Paris anyway, and the idea of being there and talking embroidery is sheer delight! We both thought it was a really nice show. Very different from Knitting & Stitching. 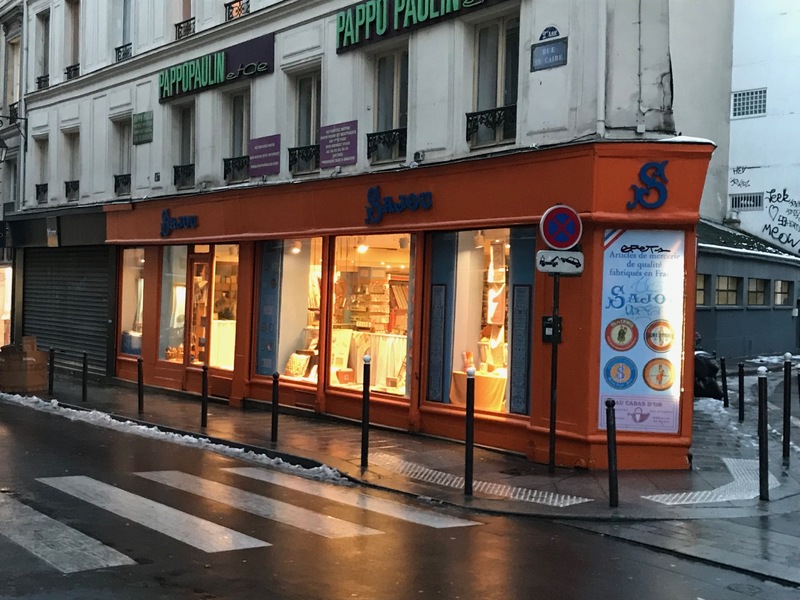 I would recommend the Stitching up Paris guide (available from Amazon) http://www.stitchingupparis.com which lists most of the needlecraft shops in Paris. I am reading this and am green with envy. 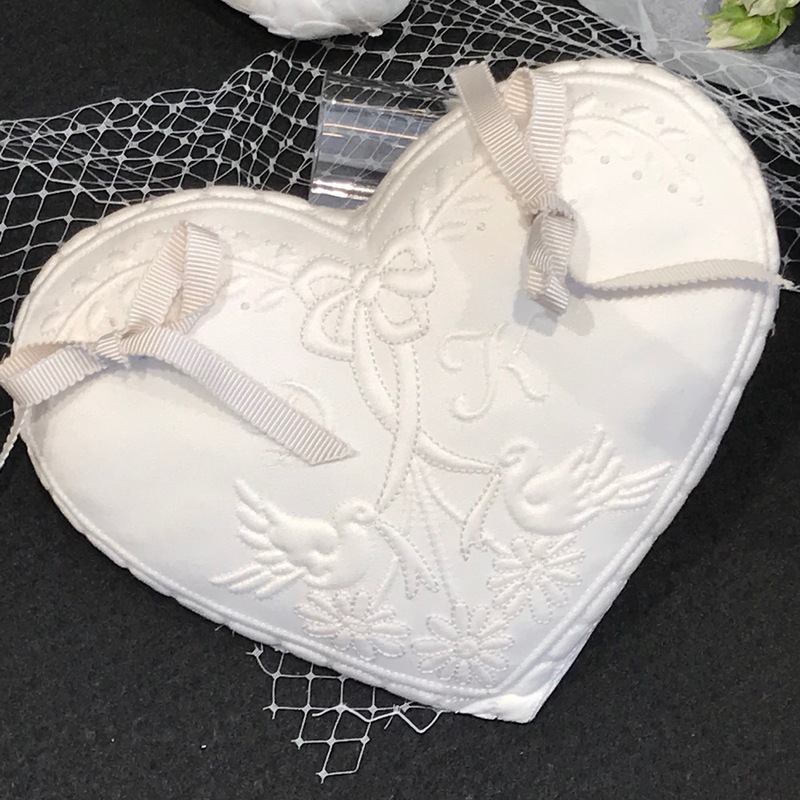 You lucky pair – so lovely to read about. Glad you enjoyed reading it despite it making you envious. We did feel very lucky to be able to do this trip! Another thing to add to my wish list!